Are you suffering from a sharp pain on the left chest that increases as you bend or lie down? 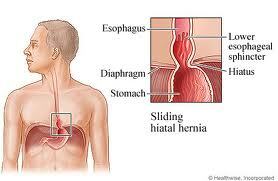 You may be suffering from Hiatus Hernia which is also known as Hiatal hernia, a complicated health condition. Read on to know all about this rare disease and also check out the Hiatus Hernia pictures. 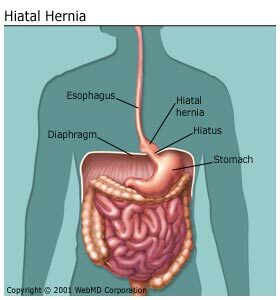 1 What is a Hiatus Hernia? It is a disorder in which a part of the stomach abnormally pushes into the chest cavity through an opening in the diaphragm. The diaphragm is the muscular partition separating the abdominal and chest cavities. The Hiatus Hernia is caused by the protrusion of the upper stomach into chest through this muscular barrier. This happens when the uppermost part of the stomach, the gastro-oesophageal sphincter, slides in and out of the chest through diaphragm. These hernias are generally small in nature and produce little or no symptoms. It is the most common kind of Hiatus Hernia. It occurs when the upper part of the stomach remains inside the chest. This variety of hernia is also not very serious and comes with only a few symptoms. 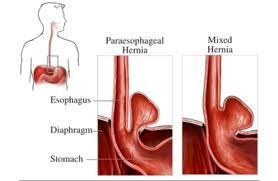 This is the most complex form of Hiatus Hernia. It arises when the whole stomach moves up into the chest. It leads to a number of symptoms and difficulties. Fortunately, this type of Hiatus Hernia is not very common. However, it is not exactly clear how these factors lead to Hiatus Hernia. Heartburn – Sufferers of this disorder often experience heartburn after having a meal. They also have a bloated feeling and flatulence while swallowing food. Regurgitation – Patients may often vomit food after having a meal. 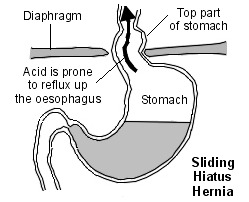 Aneamia – There is a chronic reflux of acid into the esophagus in sufferers of Fixed Hiatus Hernia condition. This leads to chronic bleeding, which in turn results in anaemia. 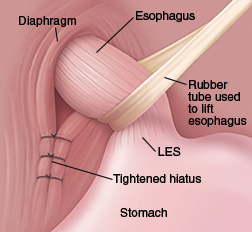 Difficulty in swallowing – The chronic swelling of the lower part of the esophagus makes the area narrow. This makes it difficult for food particles to pass into the stomach. This makes it difficult for patients to swallow foods. Difficulty in breathing– The disorder causes respiratory problems in older patients. Chest pains – The disease also leads to chest pain. Hiatus Hernia pain is common in aged sufferers. You can find a lot of pictures on Hiatus Hernia over the internet. Here we have tried to provide you with some of the best images related to the condition. If you want to learn about the disease, you must go through the pictures carefully. These will help you understand the condition better. Most people ignore treatment of Hiatus Hernia in the early stages of the disorder. But cure for Hiatus Hernia is best done in the initial stages itself. However, most patients do not experience any difficulty in the early stages of the disease. Hiatus Hernia is generally cured with a combination of home remedies and medications. If you feel the symptoms of Hiatus Hernia, you should try the elevation method. Patients of Hiatus Hernia disease are typically advised to lie down after meals with their head raised on beds. Pillows are used to keep the head lifted by 8 to 10 inches from the other part of the body. This prevents the flow of stomach acid into the esophagus while sleeping. Putting control over food intake – Avoid chocolate, caffeine, cigarettes, peppermint, alcohol, fatty foods and spearmint. These foods are known to cause flowing of stomach acid into the esophagus. 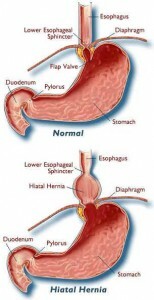 Wrong foods can cause Hiatus Hernia and diet is naturally, very important for the treatment of the disease. Smaller meals – Take small meals but eat more frequently. 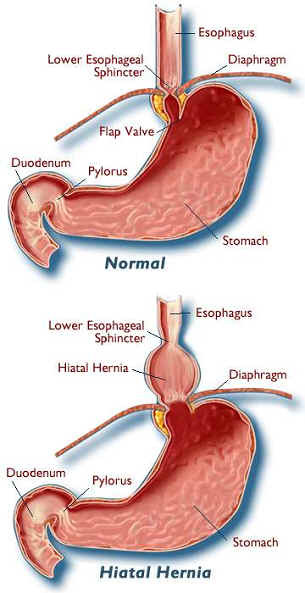 Hiatus Hernia sufferers should preferably, have their meal 2 hours or more before bedtime. Avoid pressure on abdomen – Hiatus Hernia patients must avoid all activities that put pressure on their abdomen. Bending down or performing strenuous abdominal exercise will unnecessary aggravate the illness. Tight belts or waistbands must also be avoided. Lose weight – Being overweight increases pressure on abdomen. Patients of this health condition should try to reduce weight as soon as possible to ease their abdomen. Stand after meals – It is advisable that sufferers stand or walk for sometime after having meals. Sitting or sleeping after eating can cause reflux of stomach acids into the stomach. Antacids – Antacids like Gaviscon and Mylanta are often taken to prevent symptoms caused by this disorder. It is best to take them after consultation with doctor. It is best to consult a physician for immediate recovery from the condition. The professional cure for this disorder consists of medications as well as surgery. Medications – There are some drugs that lower the secretion of stomach acid. There are also certain medicines like antidepressants and intestinal antispasmodics that provide a lot of benefits. These increase the strength of muscles in the lower esophagus. In this way, they reduce the stomach acid secretions. Surgery – In complicated cases, the patient must undergo surgery for Hiatus Hernia. Hiatus Hernia surgery is only advised for patients who do not respond well to medication. Hiatus Hernia operation is only carried out only in complex cases like chronic bleeding or strictures. 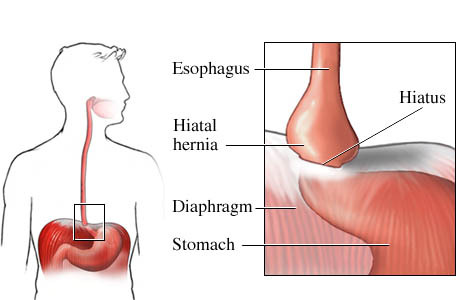 The goal of surgery is to repair the hernia and reconstruct the esophageal sphincter. 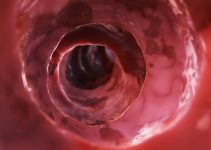 Hiatus Hernia is not a very serious condition. It is a rare disorder that affects very few people. It is curable and through proper diet, lifestyle modifications and medication, patients can bounce back to normalcy.